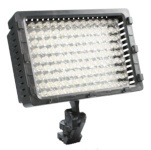 This Dorr DVL-126 LED Daylight Video Light is ideal for digital cameras and camcorders - it provides a continuous and even light produces by 126 ultra bright LEDs. The hinged bracket provides a flexible adjustment, the light can be attached on the cameras flash hot shoe. Includes 2 diffusers and a filter. The white diffuser is for creating a soft light, the orange produces an artificial light (3,200K) and the minus green filter. Also comes with 2 battery holders.